Milton has consistently been high on Money Magazine’s “Best Places to Live” list. Venerable 19th-century country houses and estates still stand among the mostly upscale, single-family homes built throughout the second half of the 20th century. With the first sign of spring, the residents of Milton are outdoors, climbing the hills in the Blue Hills Reservation and walking along the Neponset River Estuary. You will also find them preparing their personal outdoors for summer. For those without a patio, it may be the time to have one installed, for al fresco dining, entertaining and relaxing. The best way to do that is with Unilock pavers. It’s an exciting prospect, not only in thinking about the pleasure you’ll receive from the finished patio, but in the designing of it. To get you started, here are some pattern choices for your special patio. Running bond is the most popular pattern for patios. The pavers are laid side by side in a pattern similar to that of a brick wall, resulting in a modern, linear design that visually lengthens or widens your patio depending on the direction of the pavers. This pattern works really well for smaller patios. 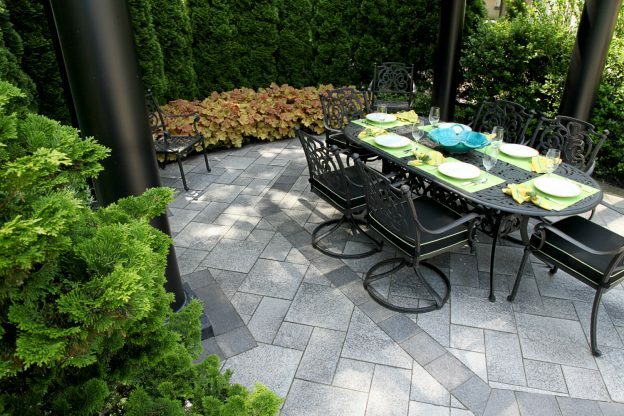 Artline pavers from Unilock have the clean, sleek lines that suit this pattern. The 5-inch-wide pavers in lengths of 6 ¾”, 10 ¼” and 13 ¼” maintain uniformity while enabling variety. The colors follow through with the theme of modernity, and you need not choose only one color. 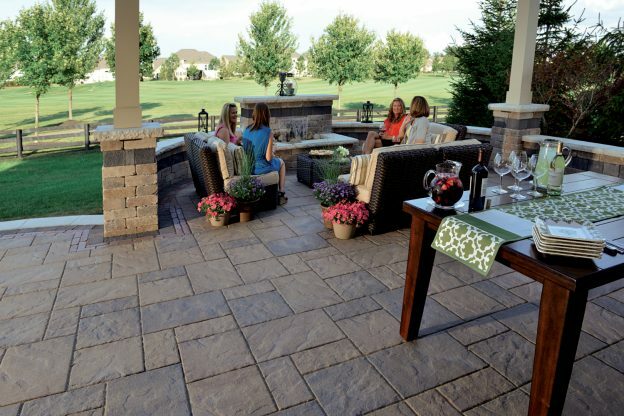 A Tuscany patio bordered with 17 ¾” x 7 ½” Winter Marvel pavers is especially striking. The basket weave is also very popular. It is a pattern reminiscent of an Old English formal garden and gives your patio a vintage quality. The pavers are installed in an alternating vertical and horizontal design that creates rows and columns. The surface of Beacon Hill Flagstone from Unilock has a natural appearance and, with its blended colors, lends itself well to the relaxed tone of the basket weave. 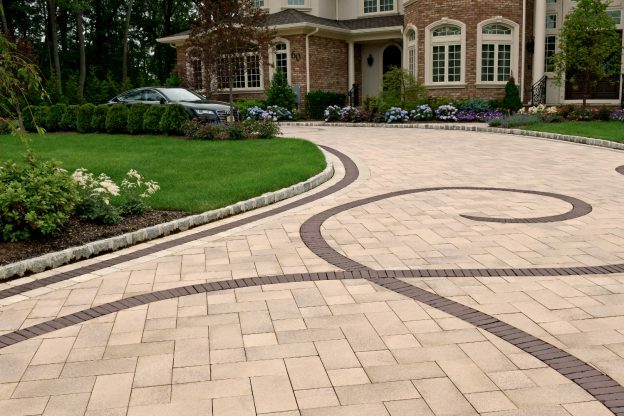 The pavers are available in large rectangles, small rectangles and squares. Almond Grove as the primary color with the occasional Steel Mountain paver gives the overall design dimension. Pavers are laid in alternating directions, creating a “V” shape with a 45-degree or 90-degree angle. The herringbone pattern creates a striking visual effect, plus it is the pattern with the most interlock, thus enhancing the strength and durability of the pavers and overall surface. Town Hall pavers are naturals for the herringbone pattern. They are cast from original brick street pavers and have a time-honed finish. The paver comes in one size and several colors. The choice of jointing compound makes a tremendous difference in the final design, so experiment with the black, tan and gray sands. These pavers are permeable, responsibly melding the antique look of a brick road with modern environmental concerns. The fan pattern originated in Europe and brings to your patio a refinement associated with the “Old World.” The installation needs a professional hardscaping contractor with the finesse of an artist to fully realize the charm of the pattern. You can bring your own creativity to the project with your choice of size, pavers and colors. The textured surface of Il Campo continues the European theme of the pattern. The brushed lines etched into the pavers are an “attention to detail” that adds immeasurably to a handsome patio. Il Campo pavers come in three sizes that together give you countless possibilities for the design. Heritage Brown with tan sand jointing compound results in a truly stunning fan pattern. This entry was posted in Design & Construction and tagged Concrete Pavers, Landscape Design, Patio, Paver Patterns on April 24, 2017 by 12850420. Your Massachusetts backyard should be a vibrant, fun area of which you can be proud. After all, it’s a place for spending time with family, entertaining guests, and relaxing after a challenging day. Here are five design essentials to set you on your way towards an incredible backyard. Don’t settle for a sterile or cookie-cutter design. 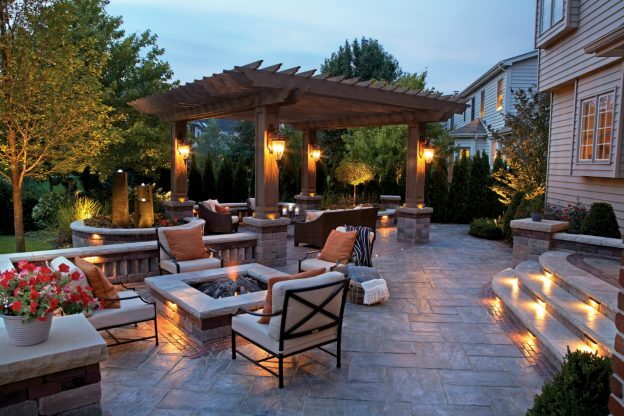 Originality is key for a design you can proudly incorporate into your backyard. Try a bold, innovative design or consider a new take on a traditional, modern, mediterranean or rustic theme. Incorporating select, personalized pieces is also an excellent way of achieving originality. Natural features also offer a unique aesthetic owing to the fact they are produced as one of a kind by nature. Consider incorporating natural stone pavers, rock arrangements or naturalistic water features to ensure your landscape stands out from the crowd. A useable outdoor living space is essential for entertaining and relaxation and may also serve as a space for preparing food and dining. As such, your patio should be designed with elegance, practicality and comfort in mind, while reflecting the beauty of the rest of your property. High quality paving materials, as well as functional facilities such as an outdoor kitchen, wet bar and fire feature are excellent options for creating such a space. Comfort also plays a huge role and can be facilitated by comfortable, carefully selected outdoor furniture or convenient permanent seating. For an evening ambience, don’t forget to include lighting. To increase usability and accessibility, a patio should be linked to the home with safe and effective walkways or flow from the home as an extension. Adding focal points to your backyard will draw the eye while creating a point around which the rest of the area revolves. Focal points also make arranging furniture and other features easier, as they tend to fall into place once focal points are positioned. Water features, sculptures, fire features, custom furniture and other unique pieces make for excellent focal points for adding character and structure to a backyard design. If a space seems boring or unlively, it may be time to incorporate a water feature. These can be used to create a green oasis in your backyard, attract wildlife and promote a soothing backyard ambience. Fountains, ponds, streams, and waterfall features are ideal for introducing dynamism into your yard. However, movement can also be introduced in a number of other ways as well. Consider a strategically placed cluster of reeds that blow in the wind, or introduce the impression of movement by incorporating sweeping lines and bold curves. Linking spaces are essential to creating flow in a backyard design, as well as promoting accessibility to your various backyard spaces. Walkways are ideal for this purpose and can be constructed from gorgeous natural stone pavers, cobblestone or even stepping stones. For multi-leveled backyards, steps are another way of linking spaces and be the perfect opportunity to showcase quality natural stone verticals. This entry was posted in Design & Construction and tagged Backyard, Landscape Design, Outdoor Rooms on April 20, 2017 by 12850420.